Limited number of free concert tickets with Stay as Home card. 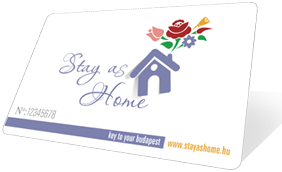 For details please check the recent news page on www.stayashome.hu website. Are you looking for some quality entertainment in Budapest, one of the most wonderful capital cities in Europe? Do you love going to the theatre, watching films, or do you feel like having fun at a great concert? In short, are you interested in cultural events? Then visit the pages of PORT.hu or Fidelio.hu, or start leafing through the pages of the free Fidelio Magazin as all of these are essential guides to find quality entertainment and cultural programs. We scout out the best events for you and the daily 300,000 visitors of PORT looking for them. We also distribute 50.000 copies of Fidelio, the cultural magazine with the highest circulation, every month in hundreds of places, so you are sure to come across it. We would like to help you have some unforgettable experiences, and to enable you to take part in as many quality programs as possible we provide discount tickets every month for some especially interesting events. We wish you a time full of cultural programs and great experiences every month of your stay here! Until the English version of the websites is ready, please follow the Facebook page of Stay as Home attentively, where you can find out about our promotions and discounts.